A taste of Colorado in beautiful downtown Estes Park. We feature over 30 different Colorado boutique wines for sampling and sales, including award-winning wines made right here in Estes Park. Come enjoy a tasting flight or a glass of wine in a low-key, family-friendly atmosphere. We carry locally-made artisan cheeses, crackers, sauces and other gourmet foods to compliment your wine selection. Enjoy these hand-crafted delicacies on a picnic in majestic Rocky Mountain National Park or sit back and relax with a glass of wine in our dining area or patio. We are a small, family owned and operated winery using 100% Colorado-grown grapes from the Grand Valley and West Elks AVA’s. 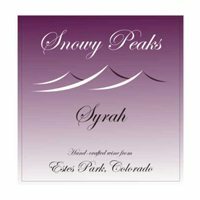 We also offer tours of our wine-making facility beneath our tasting room where wine is handcrafted in small quantities with love and care.Handcrafted wines from Estes Park, Colorado. Our family-friendly tasting room features boutique wines, artisanal cheeses, gourmet foods and unique gifts from around Colorado. Open year-round for winery tours and tastings. Located in the heart of Estes Park. Memorial Day-Labor Day: Monday-Saturday 11:00-7:00; Sunday 12:30-6:30. Open year round, please call for current hours.